The main directory contains names, residences and occupations of the inhabitants of New South Wales. This is terrific for being able to place a person at a particular location in a particular year, as well as also finding out their occupation, which can potentially lead to further avenues of research. Arranged alphabetically by town, each with brief gazetteer information relating to it, the inhabitants of each town (householders), are then arranged alphabetically by surname. Also included are maps show the agricultural districts, the pastoral districts and the principal minerals found in New South Wales. These are huge volumes, divided into several main sections. Firstly, the Sydney and Suburbs section is a street index and street by street listings of all houses as well as the householders of each address. 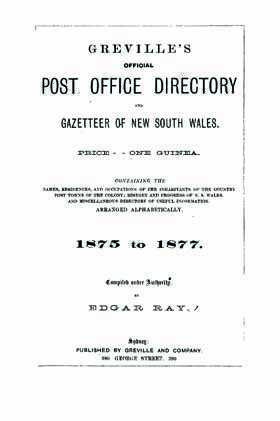 The Country Directory section lists people with trades in each place together with their occupations, and alphabetical directories of people in Sydney and Suburbs and the New South Wales Country. The directory also includes many pages of advertisements, which all provide useful information, often including names of people and places.